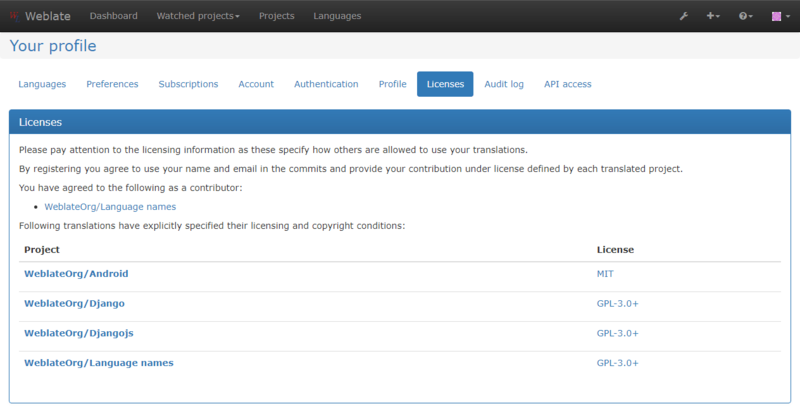 Weblate allows you to specify under which license the translations are contributed. This is especially important to specify if the translations are open to the public to raise proper expectations what can be done with the translations. There are two things you specify on the Component configuration - license information and the contributor agreement. Upon specifying license information (license name and URL), this information is shown in the translation information, but it is not enforced in any way. Usually this is best location to place information on licensing where no explicit consent is required. The entered text is formatted into paragraphs and external links are possible. HTML markup can not be used.